From Tuesday to Saturday, from 10 to 13.30 and from 16 to 20 h.
Sunday, from 10 to 14 h.
Walter Reuter. 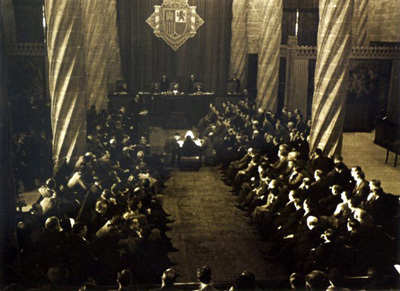 Spanish parliament session at Valencia’s Silk Exchange, 1 October 1937. 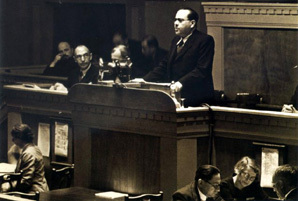 Juan Negrín, the president of the government, addresses the members of parliament. The 50th anniversary of the death of Juan Negrín López was in November 2006. He was an outstanding physiologist, a socialist, and the last prime minister of the 2nd Spanish Republic, between 1937 and 1945. 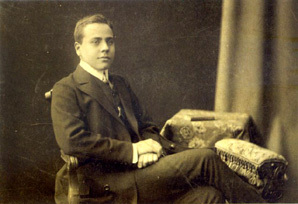 Juan Negrín is said to have been a great figure but one neglected in Spanish socialism history. Until recently no literature on his figure had been compiled. This situation has been partly made up for by a book (Ricardo Miralles, Juan Negrín, La República en guerra, Temas de Hoy, Madrid, 2003) focused on his most important period, the Civil War, and by a short biography by Gabriel Jackson in Ediciones B (Gabriel Jackson and Víctor Alba, Juan Negrín). According to the exhibition’s curator, Ricardo Miralles, “the biography of Juan Negrín (1892-1956) continues to raise controversy, despite the many years since his death. In his time, his supporters underlined his high stature as a statesman, while his detractors reduced his qualities as a ruler to nothing, portraying him as the worst traitor secretively devoted to Communism, a spurious cause. For today’s historians, both flattering defence and nonnegotiable condemnation lead any attempt of veracity on Negrín's figure to no results whatsoever. Indeed, the difficulties in approaching his figure –an unnecessary outcome of the complex historical times he lived- cannot admit a simplification to belligerent schemas. That’s why I think that insisting on the good or bad qualities of the character is a totally unfertile intellectual exercise. Even so, debates are always better than ignorance or silence. Silence about Negrín was indeed made absolute as from his death in Paris in 1956, 50 years ago". Presented at the University of Valencia, the exhibition aims to repair this historical oblivion and mutilated memory and to provide new generations with information that was missing to date. 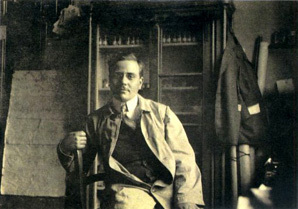 Juan Negrín at the laboratory of the Physiology Institute of Leipzig. 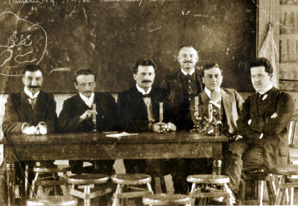 Juan Negrín in Leipzig, Germany, with colleagues from the Physiology Institute. 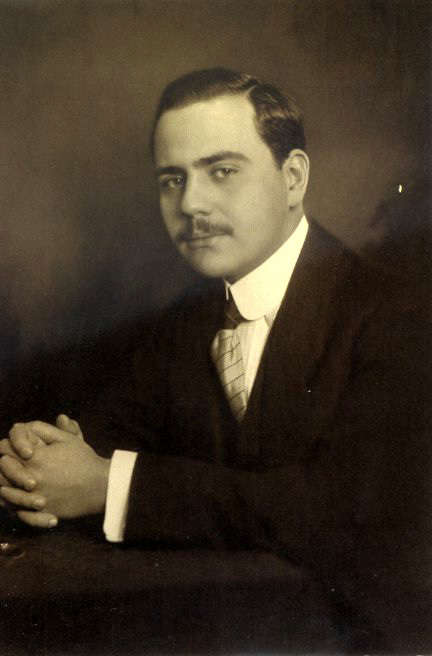 Juan Negrín López was born in Las Palmas de Gran Canaria on 3rd February 1892, in a well-off family. After completing his high education, when he was just 16, he travelled to Germany to do a medical degree. He completed his PhD at the University of Leipzig. Negrín introduced in Spain the latest research in physiology together with Santiago Ramón y Cajal, who recommended him for the commission and management of the Physiology Laboratory, at the basement of the Residencia de Estudiantes of Madrid. After validating his studies in Spain, in March 1922, when he was 30, he became Professor in Physiology by Madrid's Central University. In the development of his post in the medical college, he organised the physiology lab. Negrín joined the Spanish Socialist Party in May 1929 and, from the proclamation of the Republic, he concentrated on politics, dropping out from medical practice and academic activity. He was elected member of parliament during the three republican terms, aligning himself with the “central” fraction of the party, headed by Indalecio Prieto, a very close friend to him until the end of the civil war. At the onset of the fratricidal conflict, Negrín was appointed Chancellor of the Exchequer under the rule of Francisco Largo Caballero. His name has been associated with the transfer of gold reserves from the Bank of Spain to the Soviet Union ever since. The black legend on "Moscow's gold" started then, Negrín being turned into the servile executor of orders from Moscow. The first government of Juan Negrín was constituted on 17 May 1937. No matter how much Azaña’s personal diary made clear that it was him personally who gave Negrín the power, the chapter about his promotion to prime minister has been linked to murky business from Moscow. 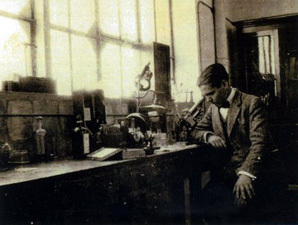 Federico García Lorca looking through the microscope. 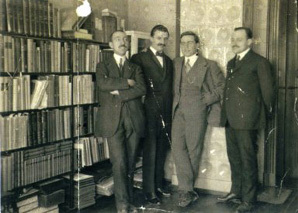 From left to right, Julio Guzmán, Enrique Moles, Juan Negrín and another friend in Leipzig, 1911. With the passing of time and the republic defeats in the battlefield, Manuel Azaña and Juan Negrín fell out. Azaña himself explained later the difference that separated his concept of resistance politics at the time from that of his prime minister. According to him, the Republic’s dilemma was never “resistance or surrender”. The difference was between “resisting is winning / resisting is the only possible policy”, which Negrín supported, and his very conviction that the war was inevitably lost from the start and, consequently, “resisting had to be a way of reaching the peace". Both conceptions turned incompatible. Under the internationalisation circumstances of the civil war, the real materialisation of resisting until the end -advocated by Negrín- would have been impossible without foreign help. As a consequence, Negrín’s policy led to international dependence on the USSR and the unprecedented protagonism of the Spanish Communist Party. In the long run, the identification of the Communist Party with the resistance policy fostered by Negrín caused the remaining political forces -parallel to the waning possibilities of the Republic- to reject the communists (rather openly in the end) and subsequently Negrín. Therefore, with successive military defeats, the internal political homogeneity of the government and the Popular Front first collapsed and finally blew up. In fact, the fundamental problem, loyalty-wise, was the evolution of the war and the fact that this was unfavourable to the Republic all along. As military defeats were taken in, in some political forces –republicans, nationalists, and socialists opposed to the Negrinist faction of the Socialist Party- but also among the military, the idea spread that it was them who had to take over the Republic’s government, perhaps imagining a possible understanding with the enemy to put an end to war, getting rid of Negrín, and having France and Great Britain as mediators. None of this was possible. With or without Negrín, Franco’s determination was always of total victory and consequently of unconditional defeat. In his immediate exile, Negrín did not manage to control the centrifugal tendencies of republicans and socialists, and his government -in office until 1945- was contested by different sectors. It is unavoidable to say that Indalecio Prieto (a genuine political mentor to Negrín in the 1930s) became his most implacable critic. On Negrín’s death, however, he deeply regretted not having made up with him. 14-year old Juan Negrín, in Germany. Julio Aróstegui, La guerra civil española. Conflicto moderno, solución antigua. “Yo lo conocí”, a selection of short texts by: Carmen Negrín, Santiago Carrillo, Francisco Ayala, Ramón Lamoneda y Marxina Lamoneda, Francisco Guerra, Aurora Arnáiz Amigo, Eulalio Ferrer and Juan Martín Tundidor López. Portrait of Juan Negrín during his stay in Germany. Photographer: Ernst Sandau, Berlin. TITLE Juan Negrín. Resistir es vencer. SYNOPSIS Juan Negrín, a scientist and a politician, was the President of the last Government of the 2nd Republic of Spain. Apart from a human and professional portrait, the documentary covers the famous story of Moscow’s Gold and the last days of the Civil War, including Segismundo Casado’s coup d'état. Ricardo Miralles, Contemporary History Professor from the University of the Basque Country, is a specialist in the History of the Worker Movement and Spanish Socialism in particular. Among other works, he is the author of: El socialismo vasco durante la II República, Bilbao 1988; Indalecio Prieto. Textos escogidos, Oviedo, 1999; Juan Negrín. El hombre necesario, Las Palmas de Gran Canaria, 1996; and Juan Negrín. La República en guerra, Madrid 2003. He has also researched on International Affairs History, with the publication Equilibrio, hegemonía y reparto. Historia de las relaciones internacionales entre 1890 y 1945; He has published numerous papers on international politics during the Civil War period in different national and international journals. 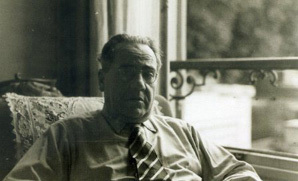 Negrín in France, 1950s; his heart condition was already serious.